This is maybe my favourite time for sale shopping. It's the real end of the sales, when there's not much left of the rails, but what is left is reduced massively. I went to Zara and bought these two tops. 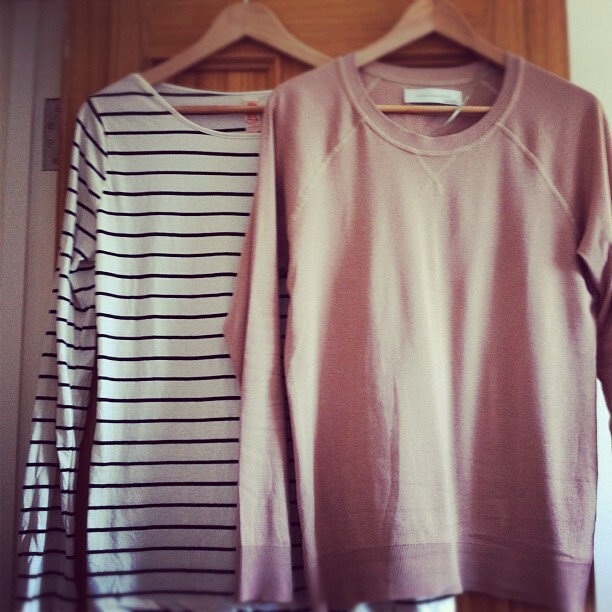 The stripey t-shirt on the left is cream with black stripes and long sleeves for £6.99, in a lovely cotton jersey. The top on the left is a thin camel sweatshirt, made of a cotton / modal mix, for £7.99. The stripey top looks particularly nice under the camel top, with the super long sleeves peeking out at the cuffs, and the hem coming down longer around the waist.